Forest succession is the change over time of the plants and animals in a forest as it matures. It is a cyclic process because a disturbance, such as a forest fire, can start the forest back at the beginning. Forests are changing all the time. Plants grow and die and are broken down by decomposers, such as insects, fungi and microorganisms, returning their nutrients to the soil. Plants also feed animals that will eventually die and return their nutrients to the soil. So the process goes round and round, renewing the forest generation after generation. Below you can see the progression of a forest from grassy meadow to climax forest. You have probably noticed that wild places change over time. An unmowed field grows into a shrubby field and eventually fills in with trees and becomes a woodland. Habitats with the same temperature, rainfall, animals and plants will still begin to change over time. This is also succession. It happens in all habitats from forest and fields to wetlands and even underwater in lakes. One community of plants and animals will slowly take over the other and replace it. Eventually any habitat will reach a stable climax community. A climax community can be disturbed by fire, a falling tree, human development, etc., and will begin succession all over again. Scientists have mapped forest succession into stages that you can look for. 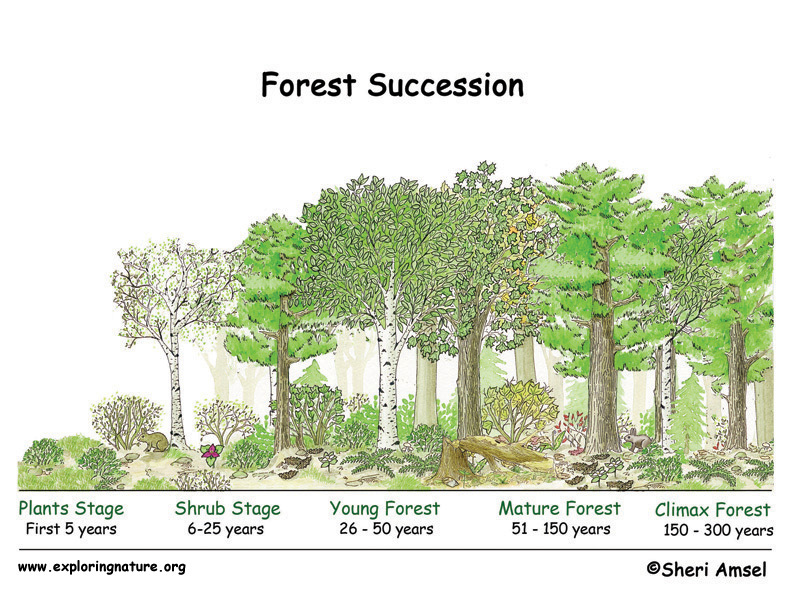 Check out the forest succession graphic below. Can you see succession in a habitat near you? Can you see a spot in the forest where a disturbance has triggered a new round of succession? Learn more about Forest Succession with the Forest Sucession Mini-Poster. Test your knowledge with the Forest Succession Activity.